Meets U.S. EPA purifier guidelines for removal of bacteria (99.9999%) and Giardia (99.9%) removes bacteria and cysts. Microfiltration method and Anticlog Technology: 143 square inches of pleated .3 micron glassfiber media. 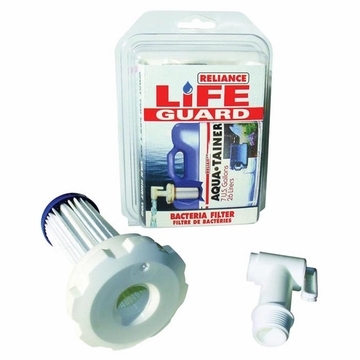 For use with Reliance water containers: Water-Pak, Aqua-Pak, Aqua-Tainer or Jumbo-Tainer. Good for up to 200 Gal. No pumping required.